The Spanish region of Andalucía (Andalusia in English) is in the southern part of the country, including the coastal provinces of Almería, Granada, Málaga, Cádiz, and Huelva. The western third of the coast faces southwest on the Atlantic, west of Gibraltar, while the eastern two thirds faces southeast on the Mediterranean. This page includes the lighthouses of the Mediterranean coast, east of Gibraltar; lighthouses of the Atlantic coast are on the Western Andalusia page. The westernmost extension of the Mediterranean Sea (from Cabo de Gata to Gibraltar) is also known as the Alboran Sea. 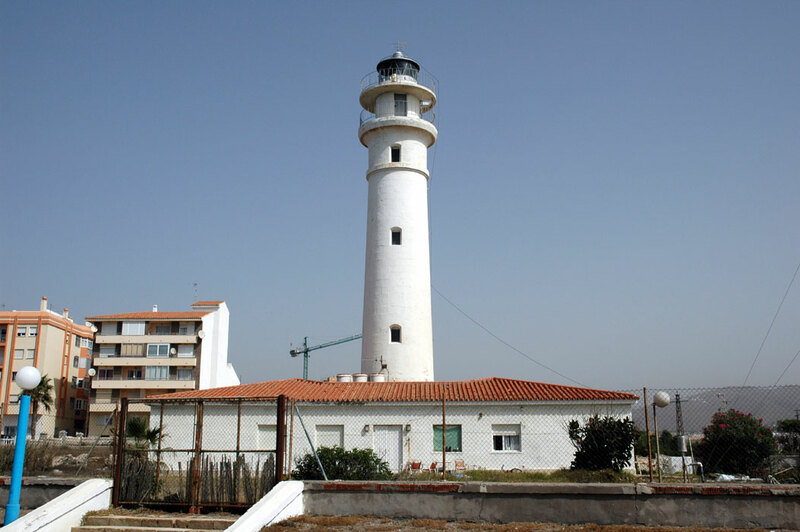 The word for a lighthouse is faro in Spanish, but its use is generally restricted to the larger coastal light stations. Smaller lighthouses are called balizas (beacons). 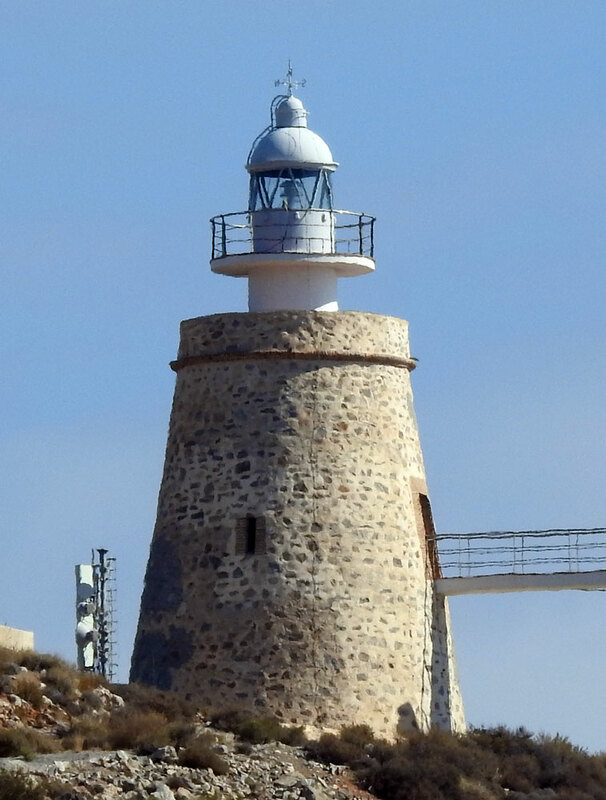 This support group for Andalusian lighthouses has an interesting blog with many photos. Photos posted by Alain Guyomard and Robert Carceller. Navigational chart information for southern Spain. 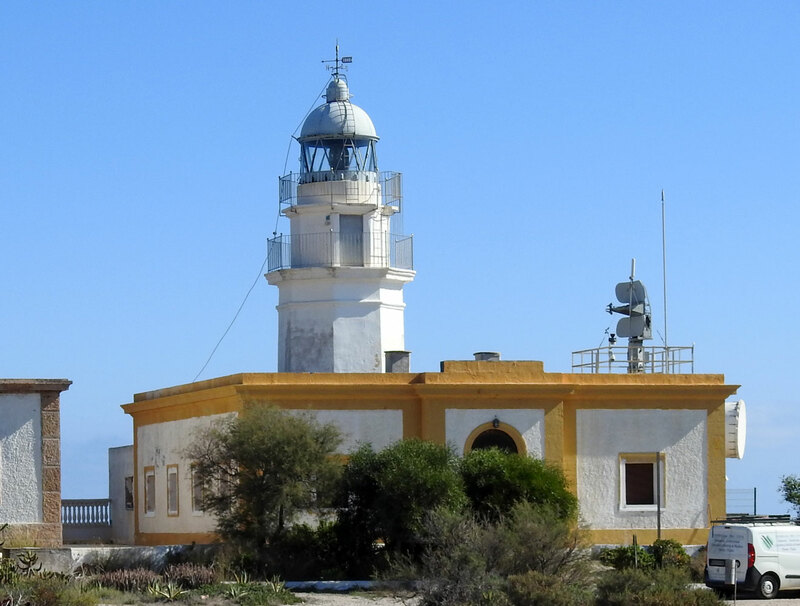 Note: These lighthouses are operated and maintained by the Autoridad Portuaria de Almería. 1881. Active; focal plane 19 m (62 ft); white light occulting four times every 13 s. 10 m (33 ft) round cylindrical stone tower with lantern and gallery, attached to a square 1-story stone keeper's house. Building painted white; the lantern is gray metallic. A photo is at right, Trabas also has a photo, Eduardo Sanz Mateo has a photo, and Google has a street view and a satellite view. 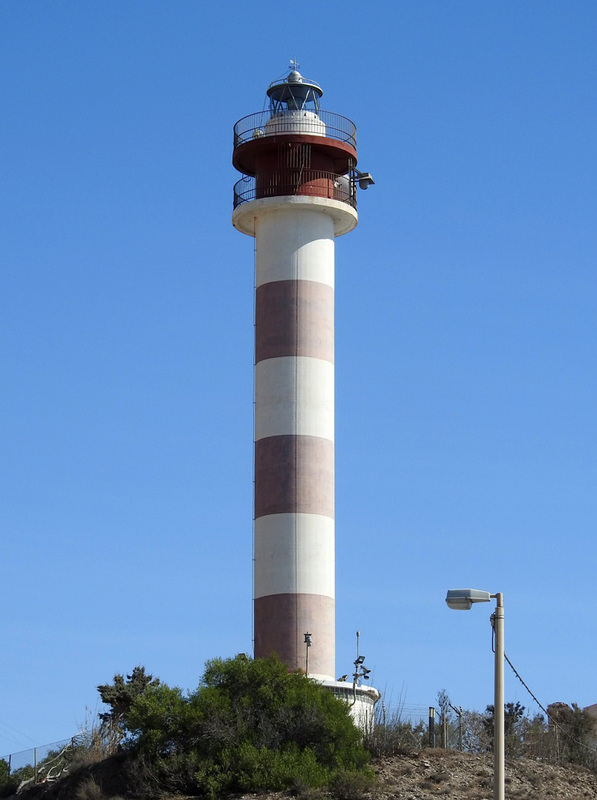 Built to replace the 1863 Villaricos light, this harbor lighthouse has remained in service even though it is dwarfed now by modern development. The building houses the port captain's office. Located on the waterfront of Garrucha, near the south end of town. Site open, building probably open during business hours, tower status unknown. ARLHS SPA-078; ES-22800; Admiralty E0110; NGA 4512. 1863 (Antonio Molina). Active; focal plane 222 m (728 ft); four white flashes every 20 s. 18 m (59 ft) octagonal tower with lantern and double gallery, attached to a 1-story keeper's house. 3rd order Fresnel lens in use. Buildings painted white with ocher trim; the lantern is painted gray metallic. Trabas has a closeup photo, Carlos Olmo Bosco has a 2008 photo, and Google has a street view and a satellite view. 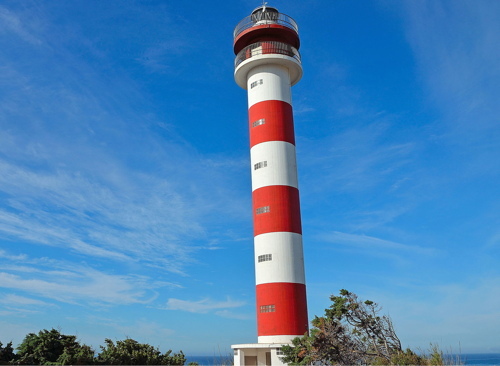 The light at Punta de la Polacra is higher, but this historic lighthouse has a much greater range of 43 km (27 mi). Mesa Roldán is an extinct volcanic dome. Located at the summit of the dome about 8 km (5 mi) south of Carboneras. Accessible by a twisting mountain road (4WD recommended). Site open, tower closed. Site manager: Parque Natural de Cabo de Gata. ARLHS SPA-178; ES-22700; Admiralty E0108; NGA 4496. Note: Almería, the provincial capital, is a city of about 200,000 residents. Surrounded by a predominantly agricultural area it has not been a major port in the past, but a modern container terminal is increasing its importance. 1991. Active; focal plane 281 m (922 ft); three white flashes every 14 s. 14 m (56 ft) round strongly conical stone watchtower, converted to a lighthouse by addition of a light on a short mast at the top. The tower is unpainted gray stone. Trabas has a photo, Carlos Olmo Bosco has a 2008 photo, a 2015 photo is available, Vicente Oliva de la Serna has a street view, and Google has a satellite view. This watchtower is comparatively recent, having been built in 1767. It has become the highest lighthouse in Spain and is said to be the highest of the Mediterranean. Located atop a peak called Cerro de los Lobos, about 25 km (15 mi) northeast of Cabo de Gata. Accessible by a steep mountain road; parking available. Site status unknown. Site manager: Parque Natural de Cabo de Gata. ARLHS SPA-213; ES-22662; Admiralty E0107.7; NGA 4495. 1863 (Antonio Molina). Active; focal plane 55 m (180 ft); flash every 4 s, white or red depending on direction. 19 m (62 ft) round stone tower with lantern and double gallery, attached to a 1-story keeper's house. Buildings painted white with ocher trim; lantern is unpainted gray metallic. Fog horn (Morse code "G": two longs and one short, every 40 s). A photo by Jesús Rubio García is at the top of this page, Wikimedia has a photo and Pablo Forcén Soler's distant view, Trabas has a closeup by Ian Wright, and Google has a street view and a satellite view. 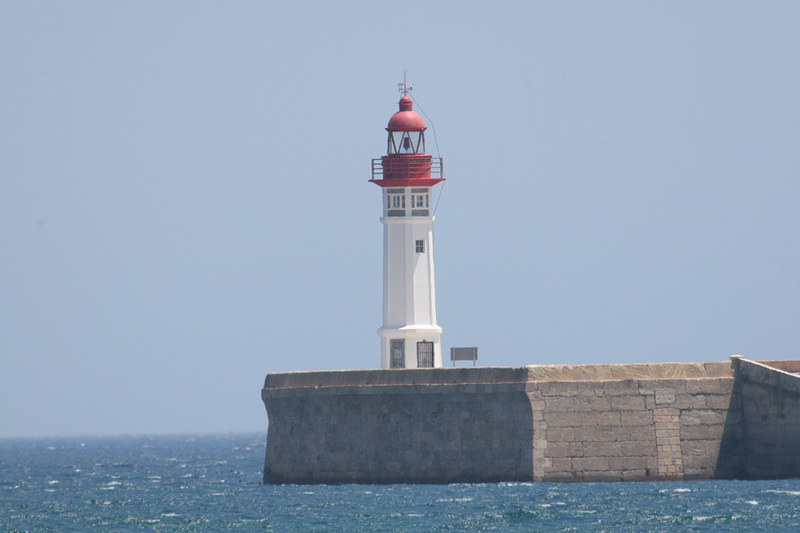 This historic and famous lighthouse marks the extreme southeastern corner of Spain, a location that has been the site of countless shipwrecks since the time of the Phoeniceans. The light station was built on the ruins of the 1737 Fuerte de San Francisco de Paula. During World War I German submarines sank so many ships off the cape that the British protested to Spain, believing that the lightkeepers must be tipping off the subs; an investigation proved they were not. 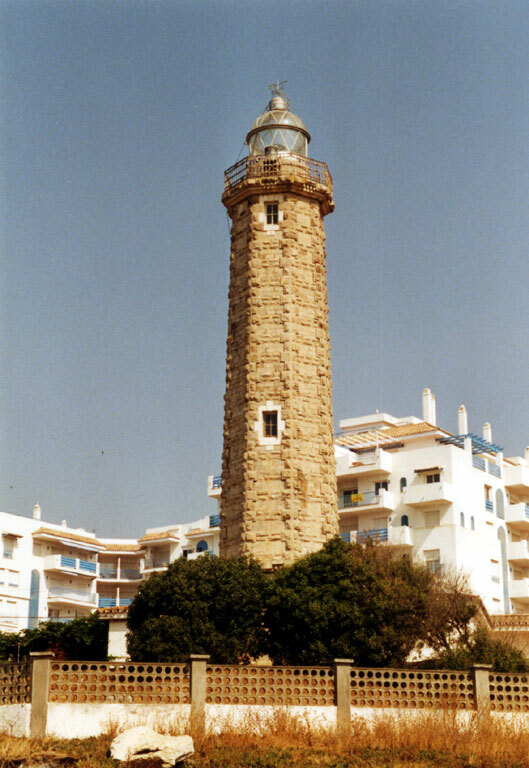 The lighthouse was repaired after being damaged by an air raid during the Spanish Civil War in July 1937. The wild area surrounding the cape is now included in a national park. Located on the southernmost point of the cape. Accessible by road; parking provided. Site open, tower closed. Site manager: Parque Natural de Cabo de Gata. ARLHS SPA-015; ES-22640; Admiralty E0106; NGA 4492. 1925 (station established 1865). Active; focal plane 19 m (62 ft); red flash every 5 s. 12 m (39 ft) octagonal cylindrical tower with lantern and gallery. Lighthouse painted white, lantern and gallery red. An evening photo by Antonio Manuel Gallardo Vargas is at right, Trabas has a photo, Carlos Moreno has a fine 2007 closeup, and Google has a satellite view and a very distant street view. The first lighthouse was made obsolete by extension of the breakwater; it was replaced with an unusual portable light (on a wheeled cart) in 1883. Located at the end of the breakwater, a long pier enclosing the harbor of Almería. Accessible by walking the breakwater. Site open, tower closed. ARLHS SPA-116; ES-22430; Admiralty E0096; NGA 4464. 1976. 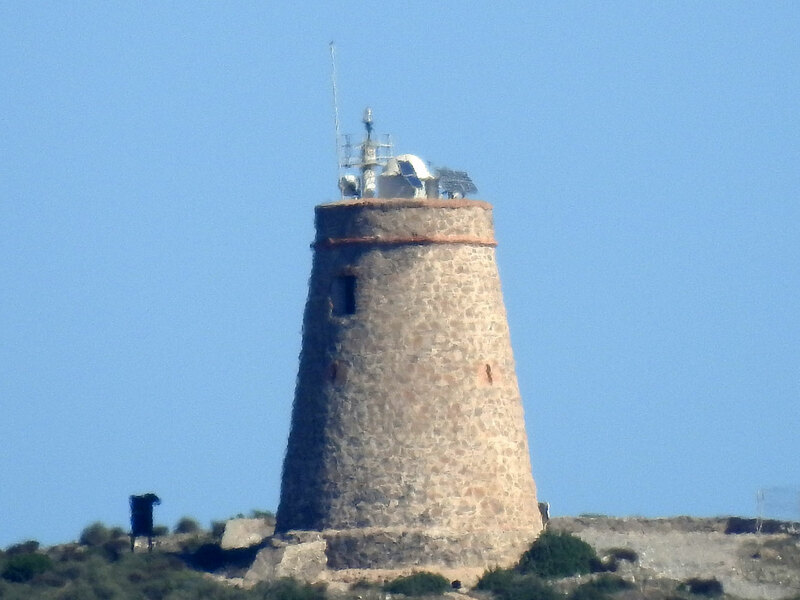 Active; focal plane 77 m (253 ft) two white flashes every 12 s. 7 m (23 ft) square cylindrical tower with lantern built atop a watchtower of the Castillo de San Telmo. Trabas has a photo, Wikimedia has a distant view, Carmelo Rivas has a closeup street view, and Google has a street view and a satellite view. Lighthouse painted white with a black vertical stripe. The castle was built in the late 18th century. 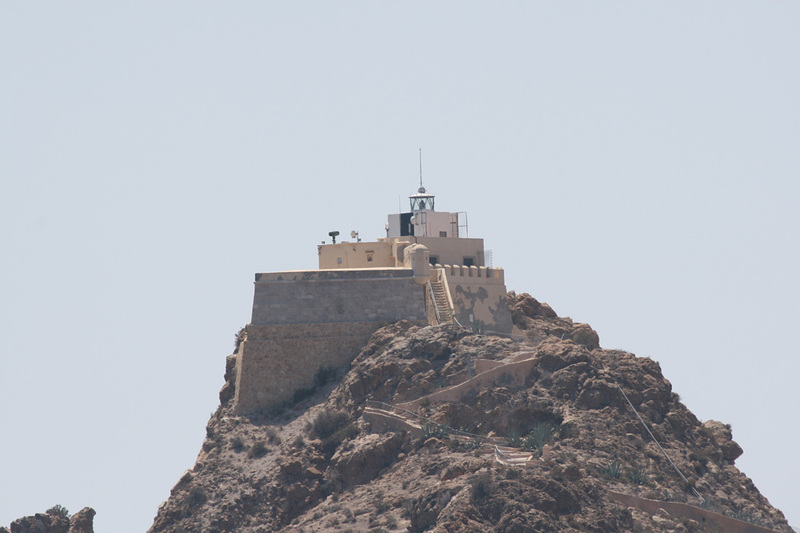 Located on heights on the west side of Almería, above Castell del Rey. Site open, tower closed. ARLHS SPA-064; ES-22360; Admiralty E0093; NGA 4452. 1863. Inactive since 1942 (a decorative light is displayed). Approx. 12 m (39 ft) round cylindrical stone tower with lantern and gallery, attached to the front of a 1-story stone keeper's house. The buildings are unpainted; lantern painted white with a green dome. A photo is at right, a good 2018 closeup photo and a nighttime photo are available, and Google has a street view and a satellite view. The lighthouse was abandoned because of changes to the harbor, and because it was too short to show up well against the lights of the town. It was replaced by lights on the breakwaters. Recently the lighthouse has been restored and transferred to the city; it is in use as a gallery for art and photography exhibits. Located on the waterfront on the south side of the harbor of Roquetas de Mar. Site open, building open daily, tower status unknown. Owner/site manager: Ayuntamiento de Roquetas de Mar. ARLHS SPA-298. 1926 (station established 1863). Active; focal plane 34 m (112 ft) three white flashes, in a 1+2 pattern, every 10 s. 32 m (105 ft) round masonry tower with lantern and double gallery, attached to a 1-story keeper's house. Lighthouse painted white with ocher trim. Trabas has a good photo, Carlos Olmo Bosco has a 2008 photo, and Google has a good satellite view and a very distant street view. The first lighthouse, a 9 m (30 ft) tower built only 50 m (55 ft) from the sea, collapsed in the surf in 1915 and was replaced immediately by a temporary wooden tower. The new lighthouse was set back 400 m (1/4 mi) from the beach to save it from continuing erosion. 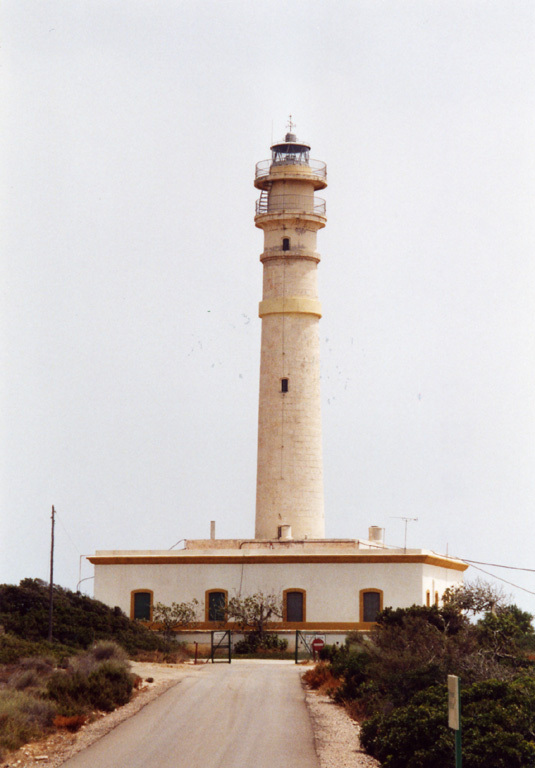 Fighting during the Spanish Civil War heavily damaged the present lighthouse and destroyed its Fresnel lens in June 1937. Located in El Sabinal, an area of dunes and wetlands south of San Agustín, at the western entrance to the Golfo de Almería. The entrance road is unmarked. Site open, tower closed. Site manager: Reserva Natural Punta Entinas-Sabinar. ARLHS SPA-258; ES-22250; Admiralty E0090; NGA 4440. 1992. Active; focal plane 22 m (72 ft); four white flashes every 11 s. Approx. 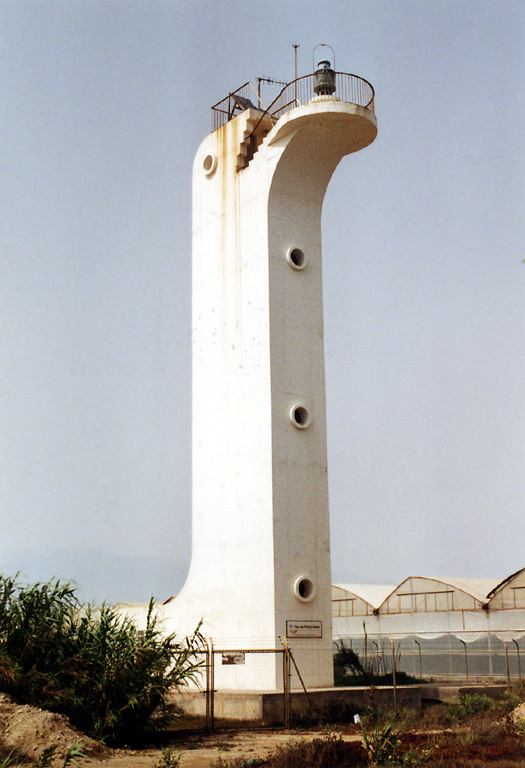 18 m (59 ft) square cylindrical concrete tower with the light displayed from a "shelf" projecting from the top of the tower. Trabas has a photo, Raul Ruiz Alvarez has a closeup, Francisco Garcia also has a photo, and Google has a satellite view. This unusual modern lighthouse was designed by the architect Rafael Melida Poch. Located just off the beach on a point of land at Guardias Viejas. Site open, tower closed. ARLHS SPA-291; ES-22140; Admiralty E0089.5; NGA 4430. 1899 (station established 1883). Inactive since 1986. 6 m (20 ft) round cylindrical stone tower attached to one corner of a 1-story stone keeper's house. Lantern removed. The buildings are unpainted. Jose Espinosa Carpintero has a 2019 photo and Google has a street view and a satellite view. The first Adra light, a 13 m (43 ft) hexagonal wooden tower, was built near the former mouth of the Río Adra; it was quickly threatened by erosion and collapsed during a storm in 1896. The light was then moved to a safer location about 3 km (2 mi) to the west. 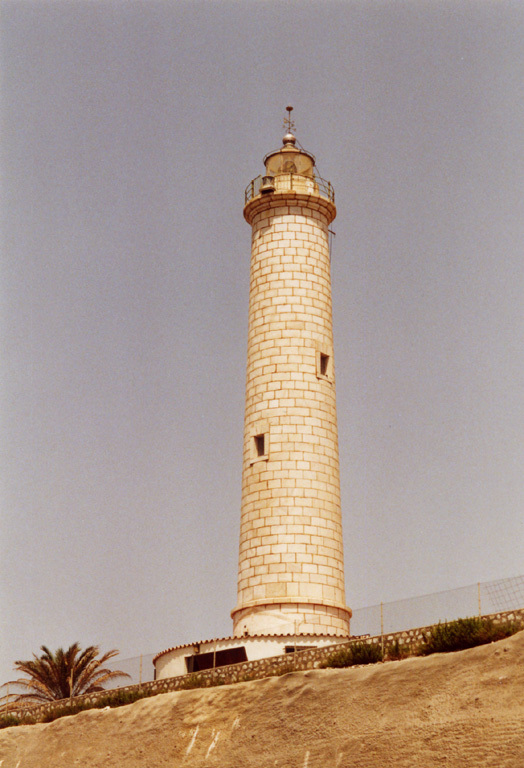 The lighthouse was repaired after being damaged during the Spanish Civil War in the 1930s. The building is now a station of the local police (Protección Civil). Site open, building closed. ARLHS SPA-334. 1986. Active; focal plane 49 m (161 ft); three white flashes every 10.5 s. 26 m (85 ft) round cylindrical concrete tower with lantern and double gallery. Lighthouse painted with red and white horizontal bands. A photo is at right, Trabas has a good photo, Carlos Olmo Bosco has a 2008 photo, and Google has a street view and a satellite view. Located just off the old coastal road (highway N-340A) on the west side of Adra. Site open, tower closed. ARLHS SPA-068; ES-22050; Admiralty E0088; NGA 4424. Flickr Creative Commons photo by dePoniente GDP Almería Occ. 1876. Active; focal plane 40 m (131 ft); four white flashes every 20 s. 20 m (66 ft) round cylindrical stone tower with gallery and a small lantern, rising from the center of a 2-story keeper's house. Tower unpainted; watch room painted white, lantern red; house is buff with unpainted red-brown stone trim. A 2017 aerial photo is available, Degree Confluence Project has a photo showing the view from the sea, and Google has a satellite view of the station. Alborán is a small, barren island 56 km (35 mi) north of the Cap des Trois Fourches, Morocco, and 90 km (56 mi) south of the Spanish mainland at Adra. The island was captured by Spain in 1540 from the Tunisian captain Al Borani, for whom it was named. Alborán had always been uninhabited except for the lighthouse keepers. However, after Soviet fishing vessels landed on the island in 1960 the Spanish navy established a base there occupied by rotating crews. In 1997 the island was incorporated into a marine reserve along with the surrounding waters. In 2003-04 the lighthouse was restored and converted to wind power; the original lantern was removed and replaced by the present small lantern. Accessible only by boat. Site and tower closed. Operator: Autoridad Portuaria de Málaga. Site manager: Armada Española. ARLHS CEU-009; ES-22120; Admiralty E0086; NGA 22780. Note: Mostly an inland province, Granada has a relatively short coastline with no major ports. 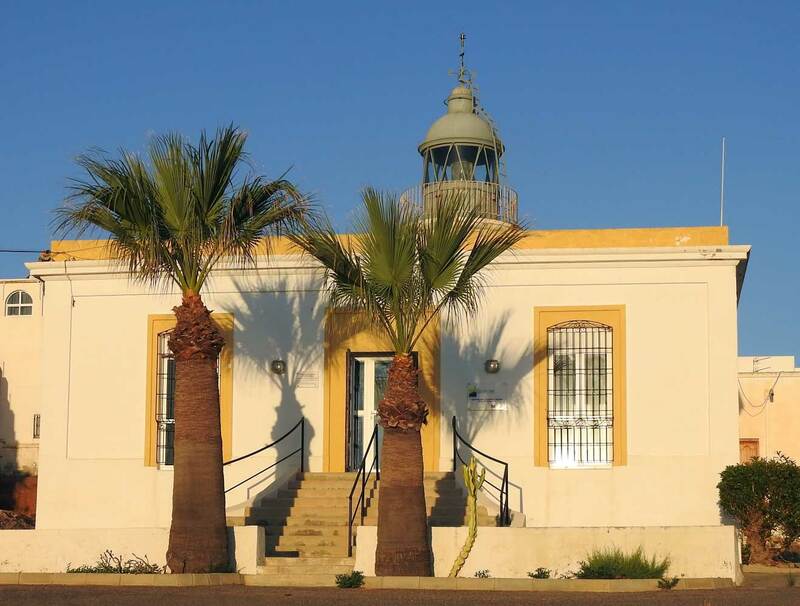 Its former port authority, the Autoridad Portuaria de Motril, has been merged into the Autoridad Portuaria de Almería, so it is that authority that now operates these lighthouses. 1992. 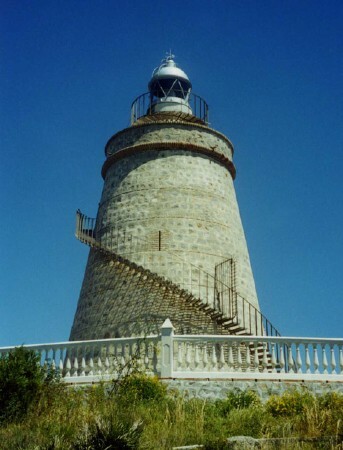 Active; focal plane 237 m (776 ft); three white flashes every 13 s. 12 m (39 ft) round strongly conical stone watchtower, converted to a lighthouse by addition of a lantern on a short cylindrical tower on the roof. Access to the light is by a bridge from a square service building adjacent to the lighthouse. Trabas has a photo, Carlos Olmo Bosco has a good 2008 photo, and Google has a satellite view. 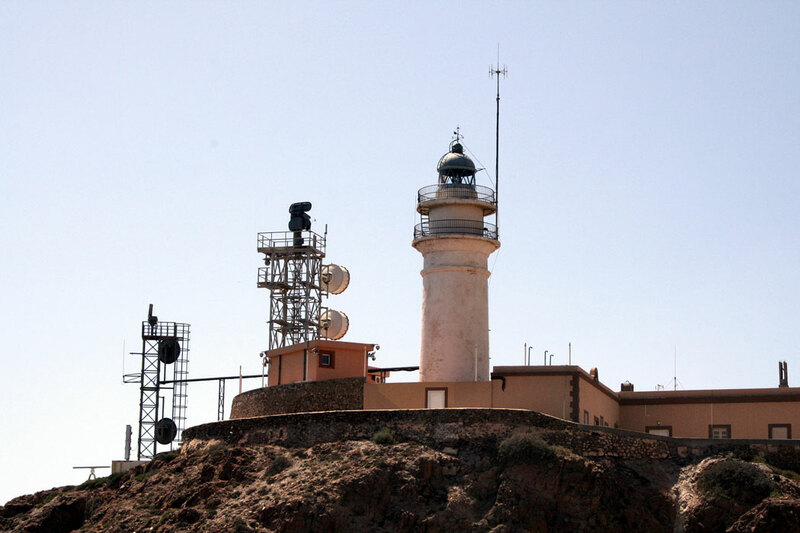 This, Spain's second highest light, is another historic watchtower renovated into a lighthouse. Located atop a sharp peak above the coast on the southwest side of Castell de Ferro; it is not clear if there is public access to this site. ARLHS SPA-060; ES-22020; Admiralty E0082; NGA 4422. 1863 (Constantino Germán). Active; focal plane 98 m (322 ft); two white flashes every 10 s. 17 m (56 ft) round masonry tower with lantern and gallery, rising from a 1-story keeper's house. Lighthouse painted white with gold trim; lantern is all glass, even the dome. Trabas has a good photo by Hans-Albert Liebetrau, Salvador Rodriguez Caña has a closeup photo, Claußen has photos, a 2017 photo is available, and Google has a street view and a satellite view. This lighthouse marks the southernmost point of the Granada coastline. Located just off the coastal highway E-15 on a high promontory, the Cerro del Chucho, about 9 km (5.5 mi) southeast of Motril. Only a small sign marks the entrance. Site open, tower closed. ARLHS SPA-042; ES-22000; Admiralty E0080; NGA 4420. 1992. 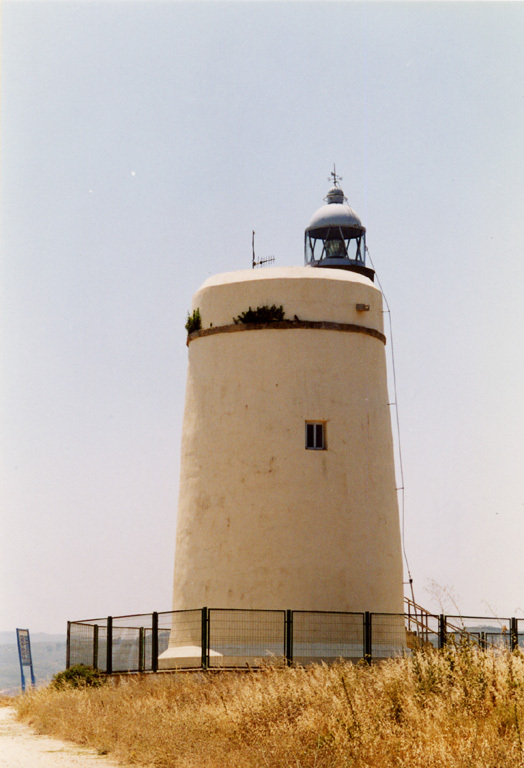 Active; focal plane 140 m (459 ft); white flash every 5 s. 14 m (46 ft) round strongly conical rubblestone watchtower, converted to a lighthouse by addition of a lantern on a short cylindrical tower on the roof. Access to the light is by an external stairway that winds around the tower. Thanks to Greg Beal for the photo at right; Trabas has a photo, a 2016 photo is available, Pako Sánchez has a closeup street view, and Google has a satellite view. This is one of the many historic watchtowers on Spain's south coast that have been converted in recent years to serve as lighthouses. In this case the tower is the Torre de los Berengueles, which dates from the 18th century, replacing a medieval tower at the same location. 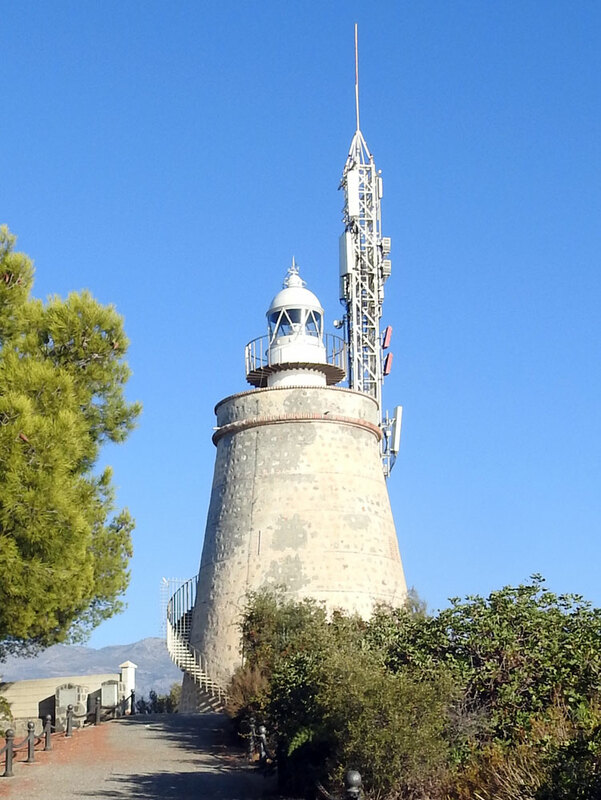 An unsightly cellphone tower stands beside the lighthouse, but visitors can enjoy the spectacular view of the Mediterranean from an overlook at the base of the tower. An upscale residential area surrounds the tower; a good map or some local guidance will be needed to find your way to the top. Located on a high, rocky promontory at Punta de la Mona, between the popular beaches of La Herradura and Almuñécar. Site open, tower closed but visitors can climb the spiral stairway. ARLHS SPA-289; ES-21890; Admiralty E0074.8; NGA 4411. Note: The province of Málaga includes the famous resort area known as the Costa del Sol, its beaches backed by high mountains and facing south on the Mediterranean. 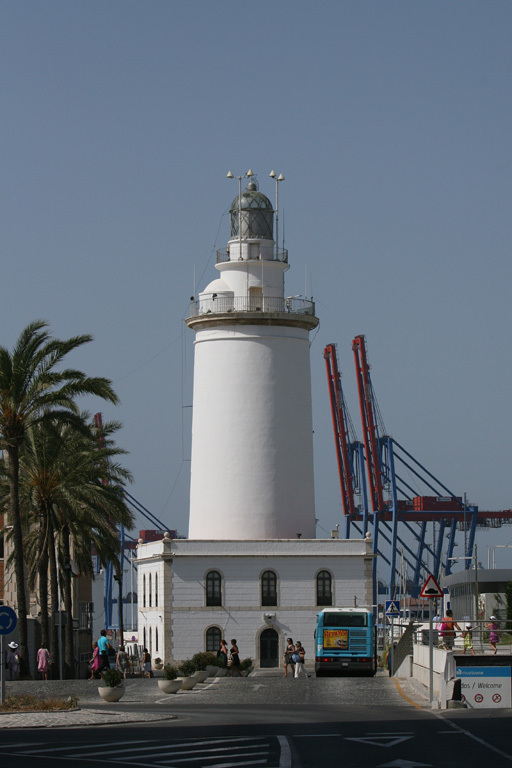 Lighthouses in the province are operated and maintained by the Autoridad Portuaria de Málaga. 1864. Active; focal plane 29 m (95 ft); four white flashes every 15 s. 23 m (75 ft) round cut stone tower with lantern and double gallery, surrounded by a 1-story keeper's house. The lighthouse, painted entirely white, rises from the central courtyard of the circular house. Trabas has an excellent photo by Hans-Albert Liebetrau, Wikimedia has photos, another photo is available, and Google has a street view and a fine satellite view. The tower was heightened and the second gallery added in 1922. Located on a promontory above the beach at Torrox-Costa, 4 km (2.5 mi) south of Torrox. Site open, tower closed. ARLHS SPA-219; ES-21880; Admiralty E0074; NGA 4408. 1969 (station established 1864). Inactive since 1974. Approx. 10 m (33 ft) square cylindrical rubblestone tower; lantern removed. A 2008 photo is available and the tower is behind a tree in the center of the photo at right. This station has a complex history. The original lighthouse, built at the mouth of the Río Vélez, collapsed in 1880 due to beach erosion both by the ocean and the river. It was replaced by a "temporary" wood tower, which served until an 11 m (36 ft) masonry replacement tower was finally built in 1930. By the late 1960s, rapid beachfront development had rendered that lighthouse useless, so this tower was built near the ocean beach as a stopgap measure. Located beside the modern lighthouse. Site open, tower closed. 1974 (station established 1864). Active; focal plane 30 m (98 ft); three white flashes, in a 1+2 pattern, every 10 s. 28 m (92 ft) round cylindrical concrete tower with lantern and double gallery. Lighthouse painted with blue and white horizontal bands; lantern dome is gray metallic. A photo is at right and Google has a 2014 street view and a satellite view. Trabas has a photo by Hans-Albert Liebetrau showing the tower painted all white. 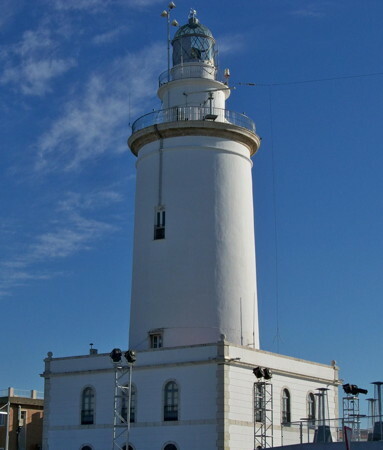 In 2013 the lighthouse was repainted in the blue and white colors of the flag of Málaga province, and in 2016 a €50,000 project restored the interior and exterior of the tower. 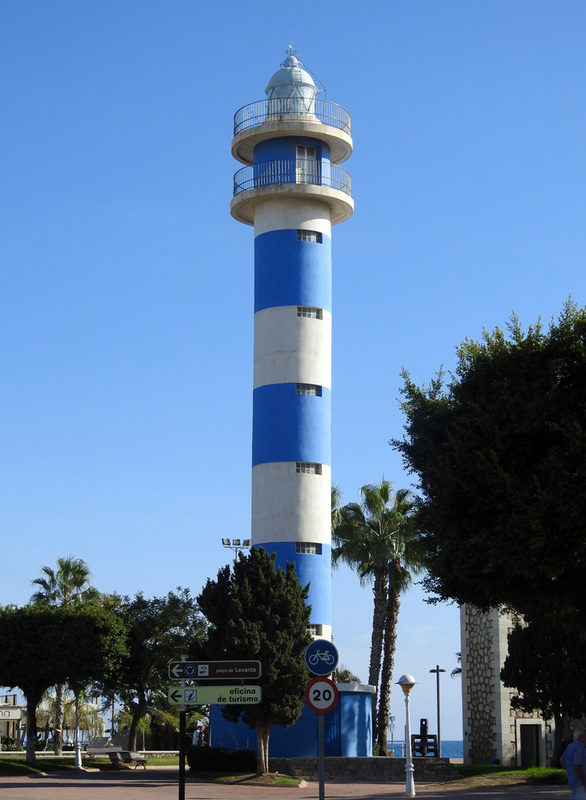 Located at the foot of the Avenida de Antonio Peré Peré on the waterfront of Torre del Mar, about 32 km (20 mi) east of Málaga and about 1.8 km (1.1 mi) east of the Río Vélez; Site open, tower closed. ARLHS SPA-277; ES-21780; Admiralty E0072; NGA 4392. Note: With a metropolitan population of at least 1.6 million, Málaga is the major metropolis of the Costa del Sol as well as the provincial capital and a major port. 1817 (Joaquín M. Pery y Guzmán). Active; focal plane 38 m (125 ft); four white flashes, in a 3+1 pattern, every 20 s. 37 m (121 ft) robust round masonry tower with lantern and gallery, rising through the center of a 2-story keeper's house. 3rd order Chance Brothers Fresnel lens (1922). Entire lighthouse painted white. Daniel Capilla's 2012 photo is at right, Franz van Pelt has a 2011 photo, Trabas has a good photo, Huelse has a historic postcard view, and Google has a street view and a satellite view. One of the oldest and most historic lighthouses of Spain, this tower has lived an eventful life. The lighthouse was damaged by an earthquake in 1898 and not completely repaired until 1913. It was further damaged by artillery during the Spanish Civil War of the 1930s; it had to be extensively repaired and refurbished in 1939. In recent years GPS and radar installations have been added. 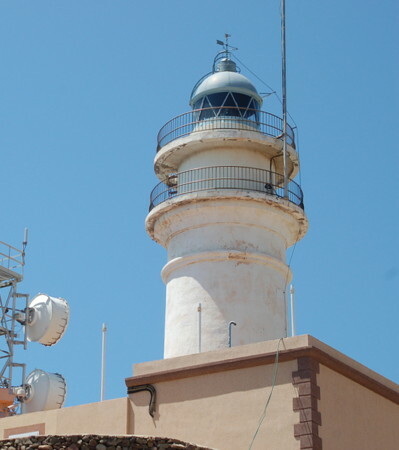 It is known affectionately as La Farola, a term usually used for much smaller light towers. Floodlit at night, it is a familiar symbol of the city's waterfront. 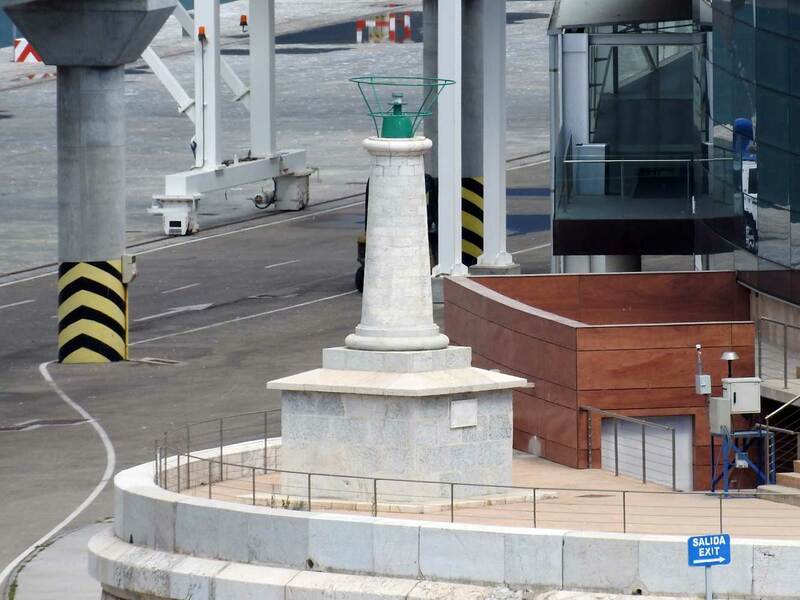 Located on the Paseo de la Farola on the east side of the harbor of Málaga. Site open, tower closed. ARLHS SPA-302; ES-21550; Admiralty E0062; NGA 4360. Date unknown. Active; focal plane 13 m (43 ft); two green flashes every 7 s. Approx. 7 m (23 ft) slender round masonry tower atop a 1-story masonry equipment room. Entire lighthouse is white. Trabas has a photo, and Google has a satellite view. ARLHS lists this light as "Malaga Head." 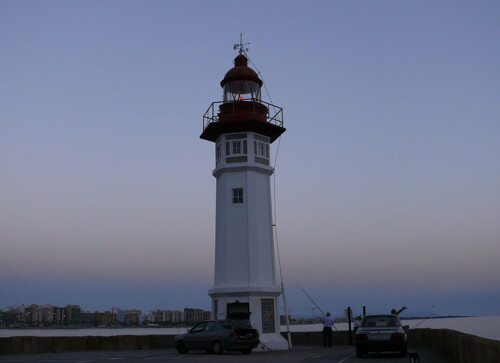 This light was located at the end of the original west breakwater of Málaga; the harbor has since been extended considerably to the south and the light is on the quay where cruise ships dock. Site status unknown, but the light can be seen from nearby and from arriving ships. ARLHS SPA-310; ES-21570; Admiralty E0064; NGA 4364. Date unknown. Removed. This was a 7 m (23 ft) slender round masonry tower atop a 1-story masonry equipment room. 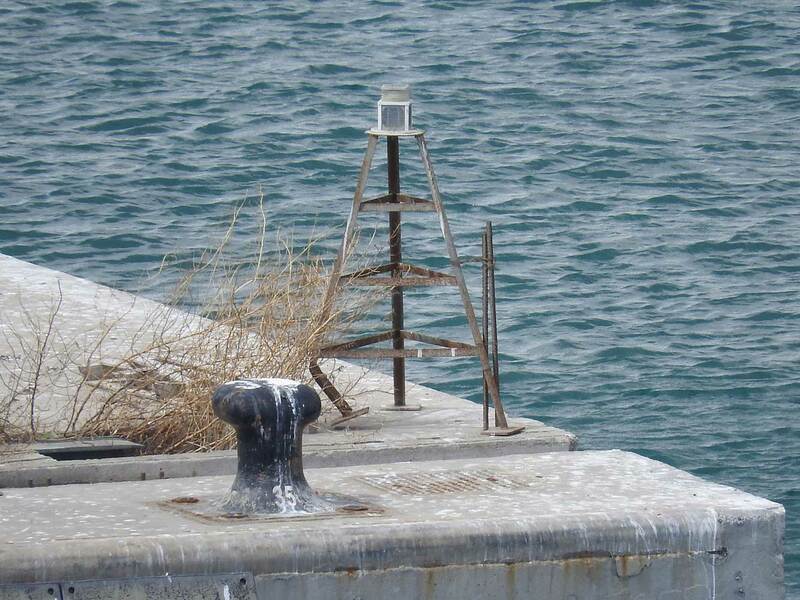 Entire lighthouse was white.The light has been removed and the breakwater shortened. Google has a satellite view of the former location. The active light (two red flashes every 7 s) is on a short tripod at the end of the truncated brealwater. Located at the end of the old west breakwater of Málaga (the harbor has since been extended and there is another breakwater to the south). Site status unknown. ARLHS SPA-303. Active light: ES-21590; Admiralty E0066; NGA 4368. 1928 (station established 1863). Active; focal plane 46 m (151 ft); white flash every 5 s. 25 m (82 ft) round cut stone tower with lantern and gallery, rising from a circular equipment building. The tower is unpainted white stone. Trabas has an excellent photo, Claußen has photos, Wikimedia has many photos, and Google has a street view and a satellite view. This lighthouse marks a major cape, where the trend of the coastline changes from east to north northeast. 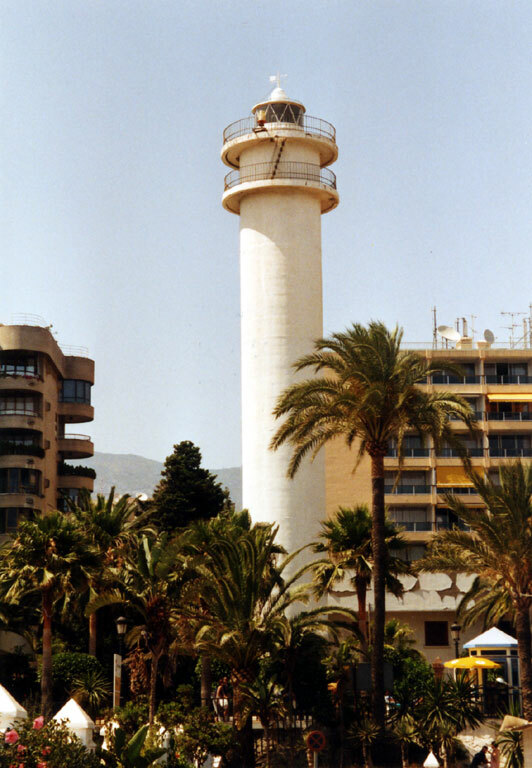 The location is quite conspicuous; part of the light station property was taken in 1999 in order to widen the A-7 coastal highway (the Autovia del Mediterráneo), which now runs very close to the lighthouse. The present lighthouse replaced a 13.5 m (45 ft) octagonal masonry tower. The lighthouse was formerly attached by a covered passageway to the original (1863) 1-story masonry keeper's house, as shown by a historic photo (bottom of the page). Located on the Punta das Calaburras about 4 km (2.5 mi) south of Fuengirola. Site open, tower closed. ARLHS SPA-198; ES-21280; Admiralty E0058; NGA 4320. 1974 (station established 1864). Active; focal plane 35 m (115 ft); two whaite flashes every 14.5 s. 29 m (95 ft) round cylindrical concrete tower with lantern and double gallery. 3rd order Barbier, Bernard & Turenne Fresnel lens in use. 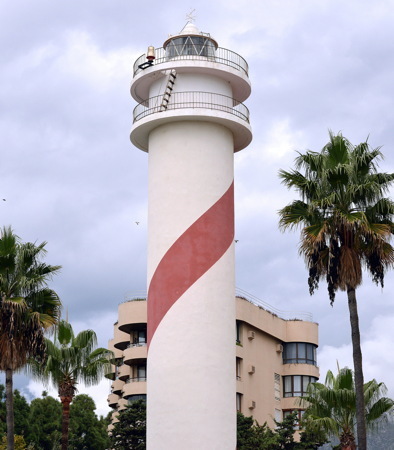 Lighthouse painted white with a single red spiral stripe added sometime in 2014-15. Harvey Barrison's October 2015 photo at right shows the spiral stripe, Wikimedia several photos, Trabas has an older (pre-stripe) photo, and Google has a street view and a satellite view. In early 2016 the port authority was asking developers to submit proposals to renovate the lighthouse as a tourist attraction. Located just off the beach in Marbella, a resort city of about 150,000 residents. Site open, tower closed. ARLHS SPA-083; ES-21100; Admiralty E0056; NGA 4304. 1922 (station established 1863). Active; focal plane 31 m (102 ft); three white flashes in a 1+2 pattern every 15 s. 21 m (69 ft) octagonal stone tower with lantern and gallery, attached to a 1-story masonry keeper's house. Original 3rd order Barbier, Bernard & Turenne Fresnel lens in use. The tower is unpainted and the lantern is all glass, including the dome. Trabas has a fine photo, a 2008 photo is available, Wikimedia has photos, and Google has a street view and a satellite view. The original lighthouse, seen in Huelse's postcard view, was only 8.5 m (28 ft) tall. The keeper's house is the 1863 original, although it has been modified over the years. Located on the Avenida del Puerto just off the Avenida de España, the seaside boulevard, in the resort town of Estepona. Site open, tower closed. ARLHS SPA-212; ES-20940; Admiralty E0020; NGA 4280. 1990 (Enrique Martínez Tercero). Active; focal plane 39 m (128 ft); white light occulting once every 4 s. 14 m (46 ft) round stucco-covered rubblestone tower with an aluminum lantern mounted off-center. Lighthouse painted a pale yellow. Trabas has a closeup photo, Vicente Fernandez has a 2018 closeup, and Google has a satellite view. This is another historic watchtower converted into a lighthouse. Located on a bluff facing the Mediterranean about 15 km (9 mi) north of La Linea. Some local guidance may be needed to find this location. Site open, tower closed. ARLHS SPA-082; ES-20820; Admiralty E0012; NGA 4266. Gibralfaro, Málaga, is a mountain topped by a medieval castle. The castle is built on the ruins of fortifications constructed by the Phoenicians, who founded Málaga in the 7th century BCE. Fires were lit on this height as beacons as early as Phoenician days. Villaricos (1863-1880), Almería. No photo available. 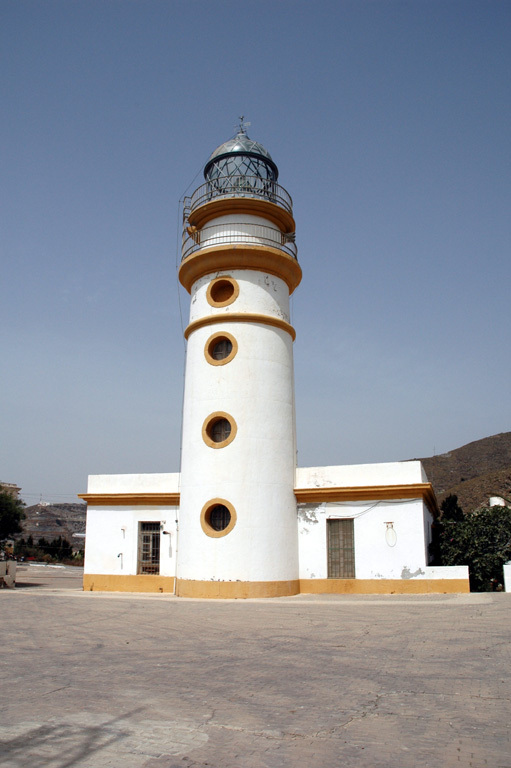 The lighthouse was replaced by the Garrucha lighthouse. Francisco García Marín has a 13-page article (pdf document) on this lighthouse. ARLHS SPA-342. Posted February 1, 2006. Checked and revised April 11, 2019. Lighthouses: 25. Site copyright 2019 Russ Rowlett and the University of North Carolina at Chapel Hill.